Recently, the CEO of Restoration Hardware Gary Friedman told the crowd at the Goldman Sachs Global Retailing Conference that he made the decision to cut all spending on search engine advertising. He proudly declared that he made the conclusion after finding that only 22 of the company’s 3,200 keywords were driving any value for the company. To his dismay, the 22 keywords of merit were all the variant misspellings of the words “Restoration Hardware”. For those of us in the marketing world, this announcement was quite shocking. It was surreal to see the press fawning over this decision as if it was some sort of act of genius – bucking the massive trend towards increased digital advertising. For some in our industry, it sends a tremor portending job loss, or minimally, endless rounds of budget reviews, justifications and probes by finance teams who dream of eliminating “wasteful” marketing dollars. But let’s take a step back a minute and catch our collective breath. The real problem here is in the fact that the Restoration Hardware marketing team couldn’t effectively measure the impacts and contributions of their search engine marketing program. They completely failed to prove the value of their efforts. It’s odd to think about: how could a major retailer not have this nailed down? The reality is that Restoration Hardware isn’t the only company that has a failed approach to marketing measurement. This episode simply exposes the painful fact that today’s marketing measurement mindset is a deeply flawed affair. Friedman’s explanation for his decision highlights several macro-level issues (and opportunities) with the state of modern marketing measurement. The short story is that Restoration Hardware determined that the lion’s share of its keywords got few- if any- clicks, and clicks that lead to sales, and therefore the ads did not have value. And he decided that the Restoration Hardware brand recognition was so strong that they did not need to spend money of the 22 misspelled brand keywords because consumers would find their stores regardless. The flaws of this logic and these conclusions are both broad and deep, but this situation isn’t too surprising given that the majority of marketers rely on clicks to tell the value story of digital advertising. Brand Awareness. Ironically, Friedman spends a lot of time talking about the power of the Restoration Hardware brand and why that is so important and valuable. He even points to the fact that their physical stores raise this brand awareness. But this awareness doesn’t magically appear- it takes real marketing investment across many channels, including digital ones. 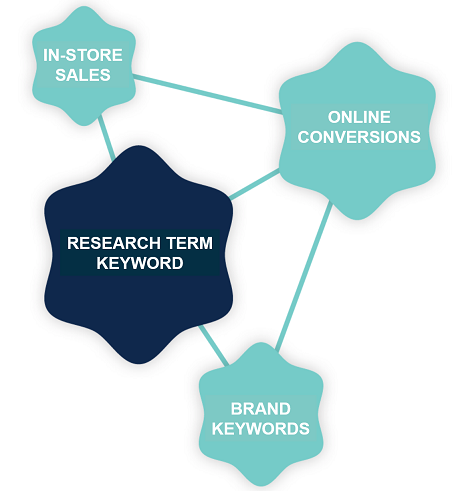 The whole point of investing in search “research terms” is to make a prospective consumer aware that one’s company offers the products they are looking for- in other words, to generate awareness of the brand and its offerings. Using clicks to measure this relationship is a fool’s errand, and this is where the digital team fell down. Modern predictive modeling approaches can and do measure these relationships- without the need for click activity- to determine whether the ad drove later sales, and therefore what the ad is worth in terms of ROI. Clearly the digital team at Restoration Hardware, and sadly teams at many companies today, did not have these measurement approaches in place to understand something so fundamental. And so they lost the battle- and their budget. Despite being a digital advertising medium, search engine marketing, can and does drive significant in-store sales activity. Because the Restoration Hardware digital team was also missing the ability to measure this digital-to-physical retail relationship, they lost an important opportunity that could have boosted significant sales. When OptiMine’s clients measure physical in-store sales along with online e-commerce sales, some digital ads are worth 5-7X more than when only looking at digital sales activity. Most retailers’ e-commerce efforts only account for 10% or less of their overall revenues, so why should they leave out 90% of the sales activity in the measurement? As one examines this case study more generally, the real failure of this entire episode is entirely related to marketing measurement- or the lack of it. The reality is that no single ad in a marketer’s ecosystem works in a vacuum, and attempting to make decisions in such a linear clicks-based approach is a poor proposition. The fact is that the prevailing marketing measurement mindset in the industry is broken. Some are applauding the moves like Restoration Hardware’s as bold, but they are clear evidence that the market needs a reboot when it comes to measurement approaches that need to move apace the highly complex cross-channel world we now live in.